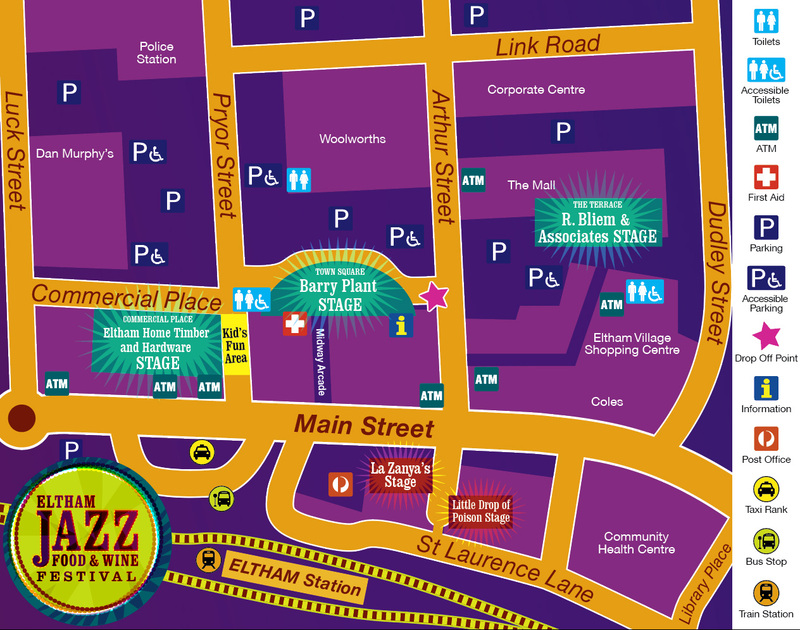 This guide provides information about the accessible features and facilities offered at the Eltham Jazz, Food & Wine Festival. We hope this guide will encourage people of all ages and abilities to enjoy the Festival and fully participate. The Festival is situated across Eltham town centre and therefore the terrain is mostly flat and pavement. However, please note that the Town Square and Commercial Place maybe congested at times. There are some slopes from the car parks to the Festival site but they are not very steep. There are also two ground-level car parks. Ramps are located close to any steps. Public transport and a taxi rank located close to the festival site. There is also parking behind the festival site. See the site map for their location. If you require any assistance or have any questions, there will be volunteers at the Information Stand throughout the festival. Hard copies of this guide and sunscreen are available at the Information Stand too. There are several recharge facilities around the site. Ask at the information stand for their location. There are two unisex accessible toilet facilities in the area. One is in Eltham Village Shopping Centre and one is next to Town Square and Pryor Street. The festival site is closed to general traffic and is controlled by traffic wardens. Attendees will have to cross Arthur Street to reach the R. Bliem and Associates Stage on the Terrace, or Main Street to access La Zanya’s Stage. We encourage attendees to use the pedestrian crossings. There are several accessible car parks where attendees can be dropped off. A drop off zone between the Town Square and Arthur Street is marked on the map. There will be two qualified first aiders at the first aid stand throughout the event. There are lots of seats and shade available next to the stages. There will be a small area reserved for people with disabilities next to the Information Stand, opposite the Barry Plant Stage in the Town Square. Please see a volunteer at the information stand or email info@elthamjazz.com.au if you are able to provide any feedback of your experience at the Festival. We would love to hear any advice on how we can make the festival more accessible.